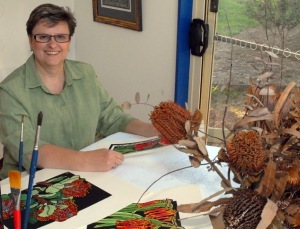 My name is Lynette Weir and I am an Australian linocut artist living and working on the North Coast of NSW in Australia. I attended Sydney College of Advanced Education – City Art Institue in Paddington, Sydney (82AE from 1982 – 1985). It is now known as College of Fine Art COFA – (UNSW). I completed a Bachelor of Education (Visual Arts). My main body of work is with limited edition hand coloured linocuts and various drawing styles and mediums. This site is made up largely from posts made on my Studio Diary and relate to explanations of how I work as an artist and in particular my work with linocuts. For a Studio Diary/blog about my work visit Soulsongart, for a comprehensive site of my art work please visit – Lynette Weir – my website of my work. I have always enjoyed photography and take all my own photos as reference for my inspiration and artwork. To contact Lynette Weir or seek permission to use her work or reproduce any of the tutorials or information on this site please click here. Lynette, Your work is stunning!